I know it’s only September and 2015 isn’t over yet, but I’m still going to announce the Best TV Commercial for 2015. It’s the 30-second Microsoft Windows 10 commercial with the three cute kids (the official name of the commercial is “Introducing Windows 10 – The Future Starts Now”). The first time we saw it, my family all smiled and talked about it. More importantly, every time we’ve seen it since, we still ohhhh and ahhhh over it. I don’t know how one can see the little girl smile, and not smile also. And I don’t know how one can see the little boy smash his face against the window, and not chuckle. Microsoft hit a home run with this one. It is the Best TV commercial this year. 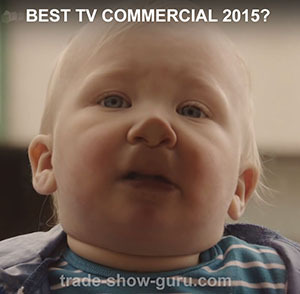 As I said, I am ranking this commercial as the Best TV Commercial for 2015, but… best doesn’t mean most effective. I love seeing this commercial. I also remember after the commercial is over that is was for Windows 10. But it doesn’t make me any more trusting of Windows 10. I’m not sure what Microsoft is trying to do here. If it is brand awareness, then I noticed it, and now know Windows 10 is available. But if they think cute kids being kids tells me anything about their new operating system, they are wrong (at least with me). Since I’ve seen the commercial, I’ve read a few reviews on Windows 10, and it seems the consensus is that is works, and is as good as Windows 7, Window XP, and Windows 95. That’s important, since more often than not their new operating systems don’t get good reviews. I have Windows 7 on my desktop and laptop, and they work just fine. I see no reason to upgrade. But if and when I get a new computer, I’ll get one with Windows 10 (based on the reviews, and not the TV commercial). Although the reviews indicate that Windows 10 works, they also indicate it’s more invasive. It’s free, but there’s more advertising and data-mining. I don’t like that. I have nothing to hide, but as a matter of principal, I don’t like being monitored so advertisers can target me. I’ll probably see what settings I can change if and when I get Windows 10. In any event, it sounds like Microsoft has a winner with Windows 10, and they definitely made a cute commercial. But it’s also a lesson that sometimes best doesn’t mean most effective. I am reminded of the Doritoes Superbowl commercial. I wrote back then that I loved the commercial, and talked about it with friends, but it didn’t make me any more likely to buy Doritoes. I already liked Doritoes, but don’t eat them very often because they aren’t very healthy. They’re tasty, but they’re not very good for you. Still, it was a great commercial… if they’re goal was brand awareness, but not if they were trying to increase sales, at least with me. So what do you think of Introducing Windows 10 – The Future Starts Now? Do you agree that this is an incredibly adorable commercial? More importantly, does it effect your opinion of Windows 10 and/or make you any more likely to upgrade to or buy a computer with Windows 10? Is is smart marketing, or just cute marketing?